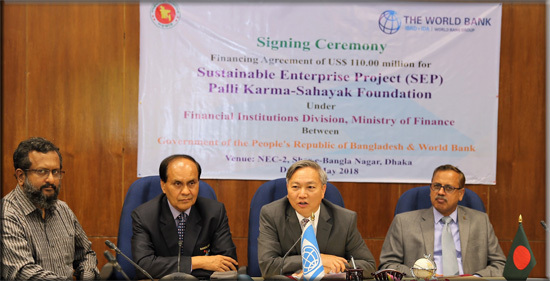 The World Bank has approved to finance US$110.0 million from its International Development Association (IDA) window to implement ‘‘Sustainable Enterprise Project (SEP)” by Palli Karma-Sahayak Foundation (PKSF). The main objective of the project is to promote environmentally sustainable microenterprises of Bangladesh. 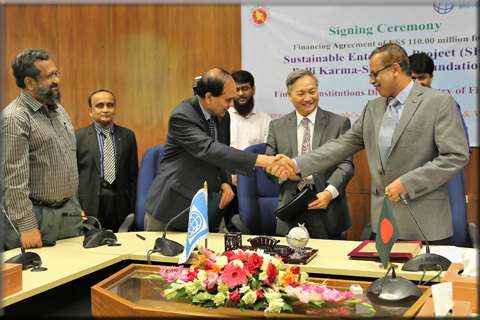 The Financing Agreement and Project Agreement of SEP have been signed in NEC-2 Conference room of Economic Relations Division (ERD), Dhaka on 16th May, 2018. 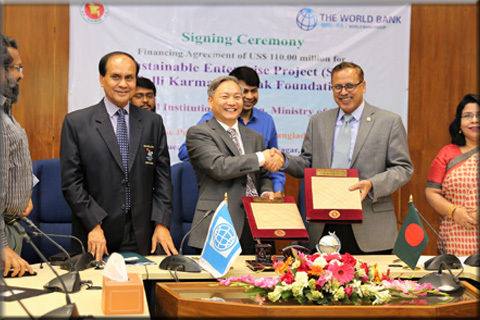 Mr. Kazi Shofiqul Azam, Secretary, Economic Relations Division (ERD) and Mr. Qimiao Fan, Country Director of the World Bank Dhaka Office signed the Financing Agreement on behalf of their respective side. While Mr. Md. 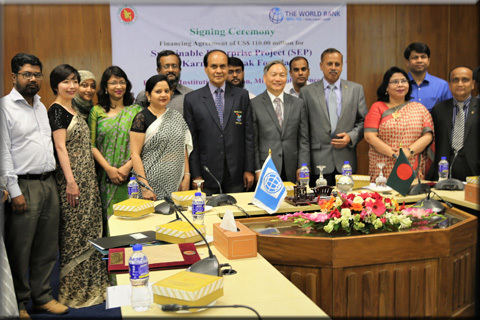 Abdul Karim, Managing Director of PKSF and Mr. Qimiao Fan, Country Director of the World Bank Dhaka Office signed the Project Agreement. Ms. Mahmuda Begum, Additional Secretary of ERD; Mr. Md. Fazlul Kader, Deputy Managing Director of PKSF; Dr. Akond Md. 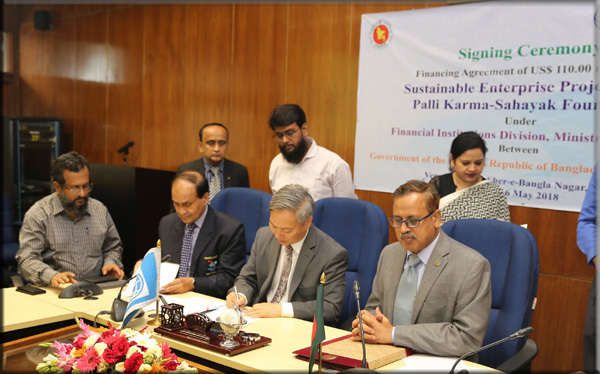 Rafiqul Islam, General Manager of PKSF; Ms. Nadia Sharmin, Task Team Leader of SEP of the World Bank; Mr. Mirza Ashfaqur Rahman, Deputy Secretary of ERD; Mr. Nazrul Islam from Financial Institutions Division (FID)and other senior officials from ERD, FID, and PKSF were also present at the signing ceremony. Project Coordinator of SEP Mr. Zahir Uddin Ahmed made a short presentation on this project at the beginning of the ceremony. Mr. Md. Abdul Karim, Managing Director of PKSF mentioned that SEP is one of the fastest negotiated projects of the World Bank. He thanked the ERD, FID, the World Bank and the PKSF officials for completing the project formalities within such a very short period of time. He also mentioned that like other projects, PKSF will maintain high quality of implementation of this project. He said Chairman of PKSF Dr. Qazi Kholiquzzaman Ahmad is very keen on supporting environmentally sustainable microenterprises in Bangladesh. Mr. Kazi Shofiqul Azam, Secretary of ERD recognized PKSF as a renowned organization of the country and said that ERD will provide full support to implement this project. He wished all the successes of this project. 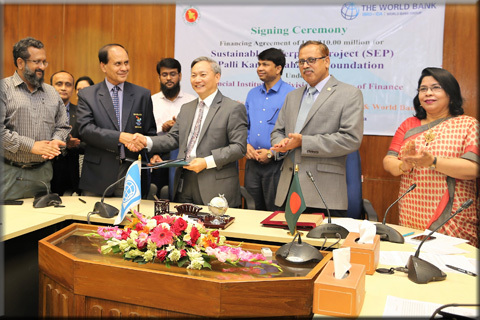 In the signing ceremony, Mr. Qimiao Fan, Country Director of the World Bank thanked the Government of Bangladesh, PKSF and the World Bank staff for completing the project formalities within a very short period of time. He also said that most of the countries follow ”do first and clean later” practice which creates nothing but damage. He also mentioned that, through this project Microenterprises of Bangladesh will be supported to adopt environment friendly practices. On March 29, 2018, the World Bank has approved USD 110.0 million for the project. Total budget of the project is USD 130.0 million; of which the World Bank will finance USD 110.0 million and PKSF will contribute USD 20.0 million. This project will be implemented within next 05 years through the designated Partner Organizations of PKSF in selected business clusters of the microenterprises.